Plastic Free Kinsale, a new community initiative to reduce unnecessary plastic use and increase recycling, was launched on the 25th January 2018 by Madeleine Murray and Tara Shine. Ireland is one of Europe’s top 5 plastic waste producers, producing 61 kilogrammes per person, per year. Now that China, who in 2016 took 95% of Ireland’s plastic for recycling, has signalled that it will no longer accept our waste, reducing the amount of plastic we consume is a must. Tara and Madeleine held a sustainability focus group with householders and businesses in Kinsale, the results of which made it clear that people want to do the right thing to reduce waste and live healthy and sustainable lives. However, people feel overwhelmed and frustrated by lack of clarity around what they should do and confusion abounds around the information on offer. 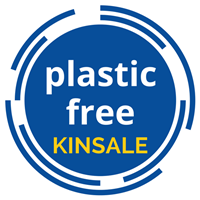 Plastic Free Kinsale was born, an initiative dedicated to tackling this messaging issue and providing simple and accessible information. Their aim is to mobilise action in homes, business, clubs and schools in the town, and to have fun doing it. Plastic Free Kinsale’s Facebook, Instagram and Twitter are used to share top tips, facts and solutions. This includes three simple things each club, school, household and business can take to reduce plastic waste. Everyone is encouraged to get involved. Discussions with people in town also revealed a demand for face-to-face events; so a recycling workshop has been organised in conjunction with Transition Towns Kinsale and Tidy Towns for the 22nd February, at 7.30 pm at the Friary. Other workshops, presentations, beach cleans and family events will be organised throughout the year. ‘We hope to play our small part in making sustainability smarter and more convenient,’ said Madeleine. ‘We believe that while people may not be experts on the environment or climate change, they are very much experts on their family’s health and well-being and financial security and have more power than they realise. We are giving the right information in a user friendly way. We are really thrilled with the positive reactions we are getting around.